Globe7 are a VOIP company, purporting to offer cheap calls. As I have a fairly limited selection of international destinations which i regularly call, I was shopping around for the cheapest rates to these destinations around May 2008 and stumbled across Globe7. Although they seem to primarily want you to use a proprietary application to access their service, they also claimed to offer a standard SIP service as well. And coupled with their advertised rates to the destinations I wanted to call being among the cheapest around, I signed up and purchased $25 of calling credit and Globe7 were more than willing to take my money. Now here is where the problems started. Instead of processing the payment as a standard purchase of goods or services, it was processed as a “cash advance” and therefore incurred additional fees from the card issuer. Although it is common for cash advanced to attract fees, Globe7 made no mention that they would be charging in this way prior to the purchase. When it came to actually trying to use the service, further problems occurred. Since i have a number of voip services, both for inbound and outbound calls I run a small Asterisk PBX at home. With this setup i get voicemail services, email alerts, automatic call forwarding to my mobile if i’m not at home, as well as the convenience of just dialing from my handset and having Asterisk route the call through the cheapest available provider, or falling back if that provider is unavailable. Having been provided a username and password for the Globe7 SIP service, i was unable to get Asterisk to work with the service, always receiving an error message claiming that my account number was not valid. After much experimentation i found out that changing my user agent made it register successfully. 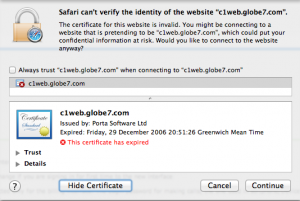 So despite claiming support for the SIP standard, Globe7 explicitly block access to any client identifying itself as Asterisk, and yet nowhere on their website did they state that Asterisk was explicitly blocked and even the error message tries to claim the account is invalid rather than stating the true cause of the error – namely that Asterisk is explicitly being blocked. My anger already boiling somewhat at this point, but having overcome the explicit blocking of Asterisk both by spoofing my user agent and by using a completely different SIP handset i decided to make some test calls to see if the service was actually any good. I decided to place a test call to my own mobile but Globe7 seemed to have major trouble routing this call. Most calls failed to complete, several appeared to ring out but never actually made it to my mobile and at least one was actually answered by someone else. I have no idea how this could happen, or what chaos is taking place internal to Globe7’s phone system. Test calls to other numbers were similarly ineffective, several calls resulted in hearing only silence not even a ringing tone or any other form of audible feedback and yet looking at my account status on the Globe7 website I had actually been charged for this. Only one call, to another mobile phone on another network ever succeeded, and even then it did not succeed in every attempt. purchasing credit for this account. Firstly i was charged $29.38, for what is supposedly a $25 voucher. suggests it didn’t actually dial the number that was supplied at all. Calling another mobile on the Orange network did work. refund of the $29.38 spent on this service. be charged additionally on each purchase of extra talk time. 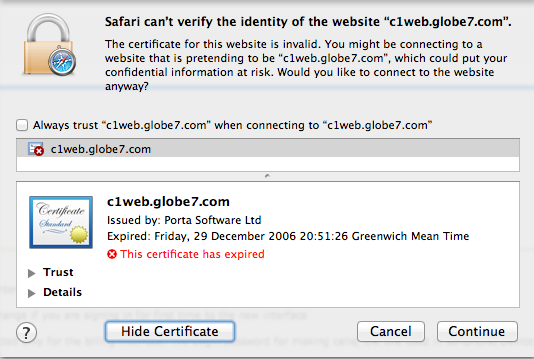 Kindly note that Globe7 does not support Asterisk. We will be glad to assist you with any further query. Well great, they inform me *after making a purchase* that they will charge VAT on that purchase… Doesn’t the law require that they disclose any such charges up front? And this is also the first time they make any mention of not supporting Asterisk, and yet there is a big difference between “does not support” and “explicitly blocks without informing customers as such”. On their website, they claim to support SIP, and Asterisk supports SIP. They make no attempt to list which SIP devices are supported, nor do they publish any list of devices which are explicitly not supported. Add to that the fact that Asterisk with a modified user agent seems to work just as well (or as badly, given the poor quality of their service) as the other SIP devices i tested their service with. were explicitly denied I would not have purchased any service. log shows the correct number (my mobile)..
_NOT_ disclosed up front and is clearly unacceptable. Your reply was also incredibly slow. This message got no response whatsoever, and I was forced to carry out my threat to dispute the charge, claim a refund via the card issuer and report the matter to Ofcom. So in short, avoid Glove7 like the plague… They may claim to offer cheap calls, yet once you factor in the VAT (which other companies disclose up front), the cash advance charge, the hassle and the fact that the majority of calls don’t complete and yet still get charged the service suddenly appears to be exceptionally poor value for money. Sick of marketing calls and companies which demand your phone number for the sole purpose of calling you up to sell you stuff you don’t want? This number goes through to an automated system that plays samples of Borat saying various random things… He starts off saying hello, and then says he’s pleased to meet you, followed by a few other quotes. In my limited tests, unwanted callers usually tend to speak to Borat for a while, as they think the person saying hello and asking who he’s speaking to is a real person and not a recorded message. an unfair advantage over other eBay sellers. third party services such as payment services onto buyers. applies only to items listed on eBay.co.uk. What this basically boils down to is. I as a seller cannot make the buyer pay to cover the charges imposed by paypal… Thus, if a buyer pays for the item with cash, a cheque or some other method I receive all the money. If they pay using paypal, I lose a percentage of it. I don’t consider this at all unreasonable, if a buyer wants to use a method of payment that will cost more, they should foot the bill, not the seller. Ebay are doing this because making buyers pay the paypal charges discourages people from using it, so they screw the sellers instead. Also let’s not forget that paypal take a cut from the money intended for shipping costs, so sellers have no choice but to inflate shipping costs to cover it. So as a consequence, i will stop using paypal. The requirement to have the original CD/DVD in the drive to play a game for instance. I have several games installed on my HD, and the idea of installing games in the first place, was to improve load times and AVOID THE HASSLE OF HAVING TO LOAD ORIGINAL MEDIA AND/OR DAMAGE IT. I work away a lot, and carry a laptop with me at all times. I don’t want to carry a stack of CDs on the off chance i might want to play them. I dont want to keep transferring the media between my stack at home, and my laptop bag. People with pirate copies are much better off, they dont have to worry about losing media, they dont have to worry about bringing it along with them. It is actually advantageous to the game player to download a pirate copy. This is in stark contrast to the old anti-piracy advertising associated with analogue video/audio, where pirated copies were noticeably inferior to the originals. The advent of digital media levelled the ground, but rather than do something to compensate for that, companies have gone the other way and taken steps to make the originals actually inferior to the pirate copies. Having to enter license codes or serial numbers is equally irritating, most people simply aren’t organised enough to keep track of all these small scraps of paper with serial numbers on them, and most people don’t want that much paper laying about. And losing that small piece of paper results in them being completely unable to use software they may have paid a large amount of money for. Also the old code wheels, and requirements to enter a word/letter from the manual. This was common years ago, on the amiga for instance, and was incredibly irritating. Some even required you to re-enter codes at random points throughout the game, and would punish you if you entered them wrong. So, i won’t buy games where i have to keep the DVD in the drive to play, and i won’t buy software where i need to enter a code to use it. Why should legitimate customers be at a disadvantage relative to pirates? If this is the thanks we get for buying software, then i think i’l side with the pirates as they don’t shaft their own customers.